Azerbaijan’s capital on the Caspian Sea combines a medieval old town with 19th-century European palaces and today’s ultramodern skyline. Once notoriously expensive and now affordable, this relatively unknown travel destination has something to suit everyone – from history buffs to food connoisseurs. 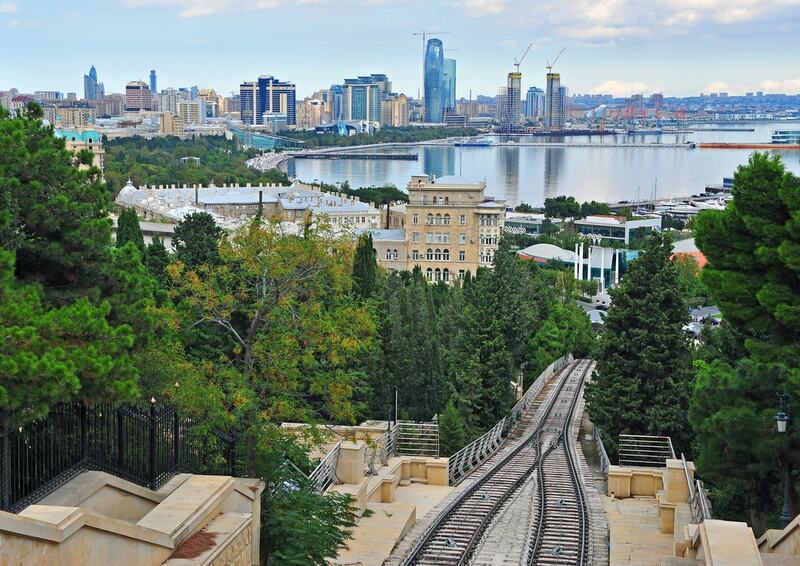 Here are 20 of the best Baku attractions. 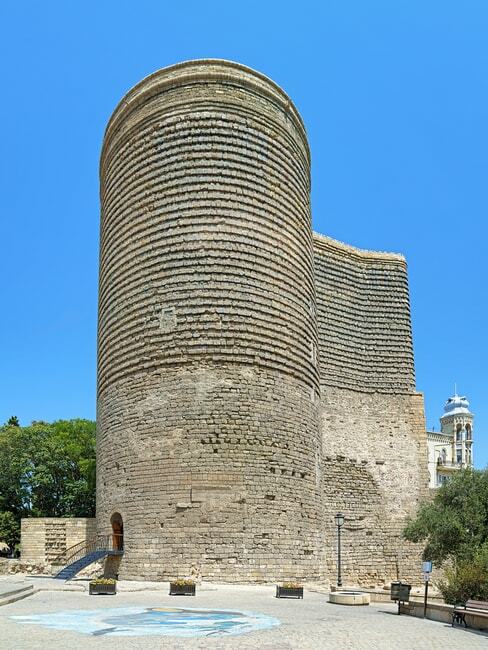 Baku’s UNESCO-listed fortified old town was once the medieval capital of the Shirvan Shahs. Today, it’s the capital’s heart with Maiden Tower, traditional carpet weavers, bars and restaurants. 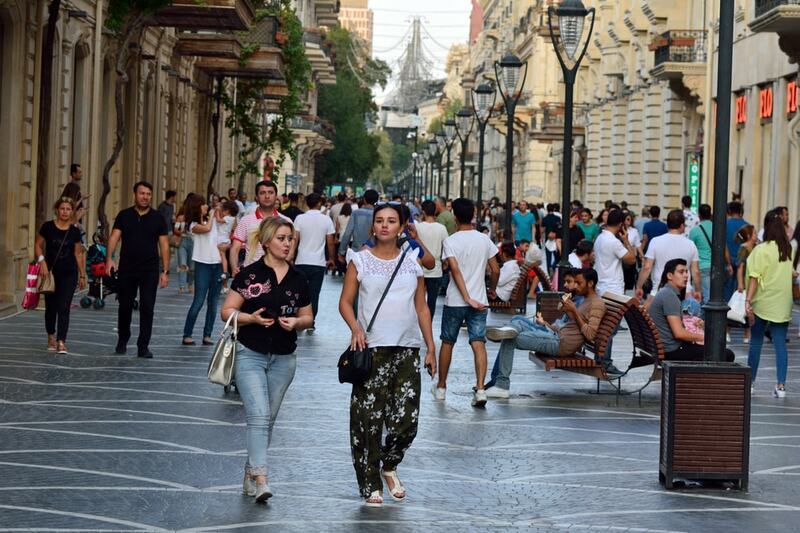 Visiting traders in a bygone era often referred to Icheri Sheher as the Acropolis of Baku. The cylindrical tower has a mysterious story. Dating back to more than 1000 years, experts believe the UNESCO-listed Maiden Tower served as a Zoroastrian temple before becoming a watchtower in the 18th century. Follow the spiral staircase to the top of the 29 metre-structure (95.1 feet) for the best views of Ischeri Sheher. The Palace of the Shirvan Shahs, the ruling dynasty for 800 years, is on the back of the 10 Manat banknote. 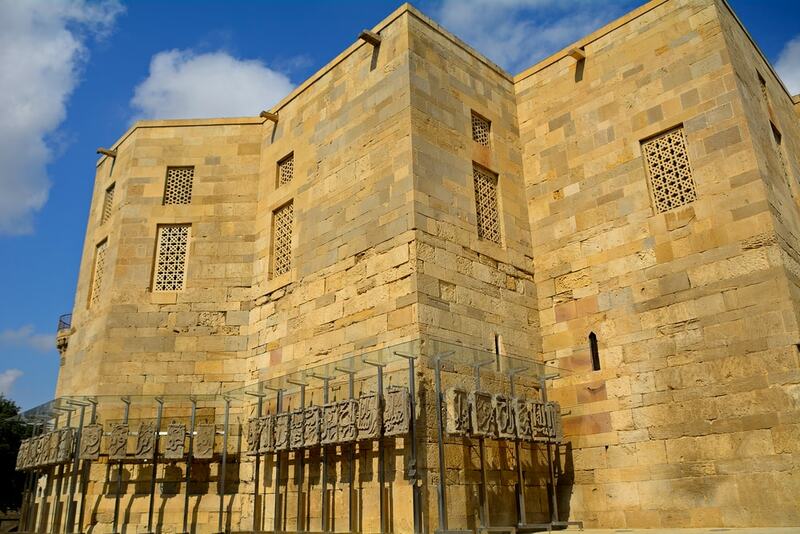 The 15th century UNESCO-listed complex has a palace, mosque, burial vaults and a mausoleum making it one of the top Baku attractions in Icheri Sheher. Travel gives you the opportunity to learn about the world and see exhibits and artefacts you otherwise would miss. The Museum of History, inside an Italian Renaissance-style mansion, has more than 300,000 artefacts. Exhibits cover everything from ancient to modern history and ethnography making it the largest museum in Azerbaijan and a top Baku attraction. 4 Hadji Zeynalabdin Taghiyev, Baku, Azerbaijan. Tel: +994 12 493 23 87. The opulent baroque House of Government on Neftchiler Avenue was built in 1952 by the Soviets. Ministry offices occupy the space inside. The main attraction is the architectural beauty, especially when it lights up at night. Uzeyir Hajibeyov, Baku AZ 1000, Azerbaijan. Tel: +994 12 493 70 64. 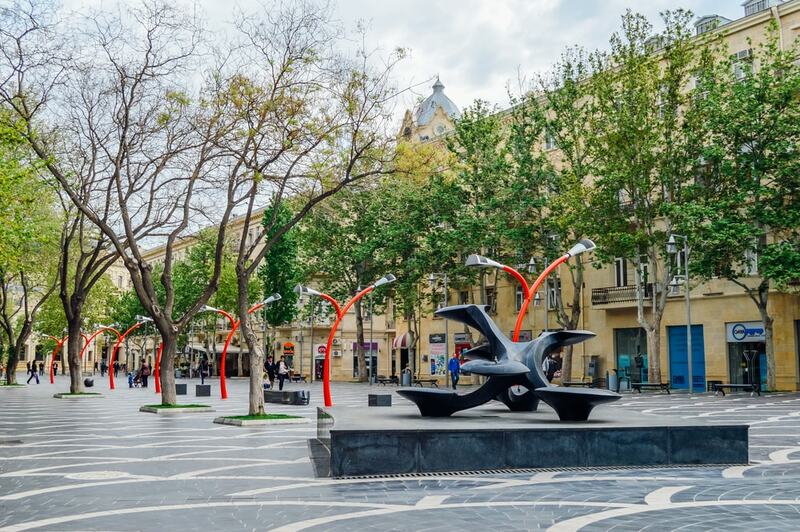 The pedestrianised Fountain Square, formerly Parapet, is one of the must-see Baku attractions. Dozens of fountains fill the area stretching from Nizami Street to the eastern walls of Icheri Scherer. Several bars, cafés and restaurants with outdoor terraces fill the lower floors. The tallest of the three Flame Towers reaches 182 metres (597 feet) and is perched majestically above Baku Bay. From a distance, the trio resembles flames. And at night, the exterior lights up in the colours of fire. National Flag Square marks the western end of Baku Boulevard. Officially opening in 2007, the square is a symbol of national pride. The giant flag measuring 70 by 35 metres (229.7 by 114.9 feet) on a flagpole standing 162 metres (531.5 feet) was once in the Guinness Book of Records. Tajikistan now holds the record. Baku Boulevard, a 3.5 kilometre-promenade (2.2 miles), hugs the Caspian Sea with an amusement park, bars and cafés along with a cacti garden, Mini-Venice, and the Baku Eye. Beginning at National Flag Square and ending at Freedom Square, this is the best spot for views of the Flame Towers and a relaxing stroll along the coast. 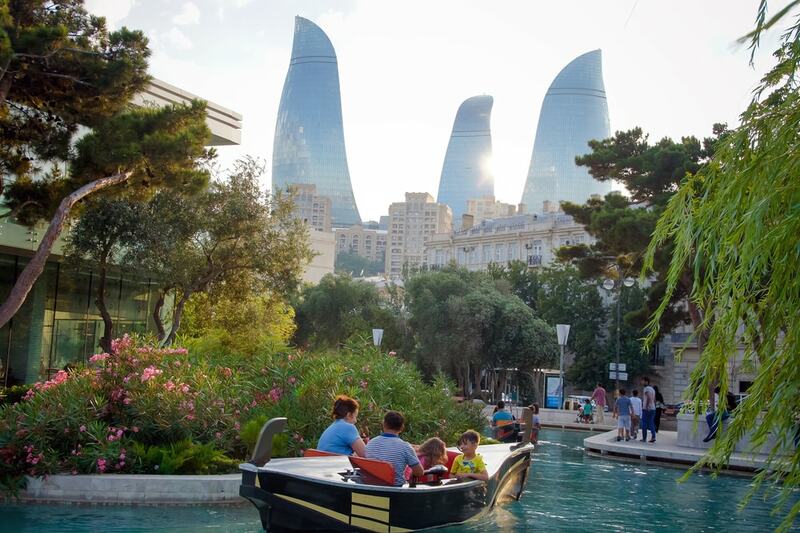 If you haven’t visited The City of Canals, Baku’s mini-Venice will give you a taste. The small area on Baku Boulevard has two large islands and smaller ones interconnected with bridges. Locals and tourists pay a few Manat to ride the Azerbaijani version of gondolas through the artificial canal system first opened in the 1960s. A top Baku attraction for a romantic evening. Opening hours: 10:30am to 11:30pm. 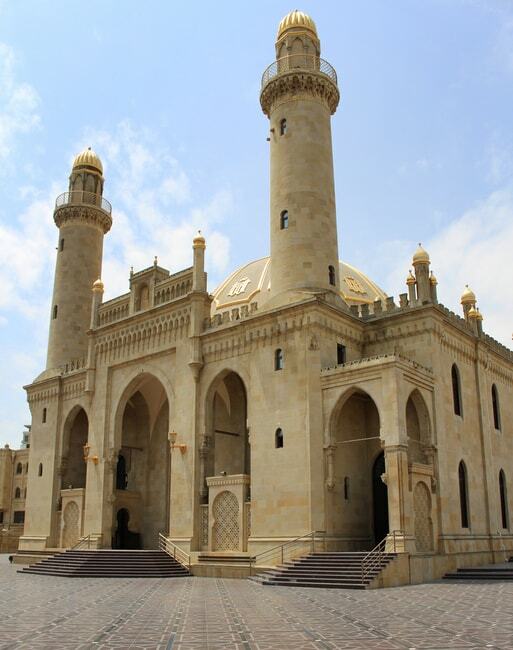 Three years after the completion of Central Baku’s sandstone Teze Pir, the mosque with gold plated minarets fell victim to the 1917 October Revolution. Bolshevik-ruled Baku turned the mosque into a cinema and later a barn. It reopened as a mosque again in 1943. The funicular takes passengers from Neftchilar Avenue to Martyrs Alley. Views from the top start with Icheri Sheher and the Old City in the near distance and the new skyscrapers towards the horizon. The extravagant Venetian gothic palace has a sad story. Early 20th century oil baron Agha Musa Naghiyev lost his son, Ismayil, to tuberculosis. He hired world-class Polish architect Jozef Plosko to design the building in memory of his son, which opened in 1913. The baron paid for the project and then donated it to the Islamic Charity. It became a meeting and assembly hall, and is now the Presidium of the Academy of Sciences. Another first for Azerbaijan: The Carpet Museum, established in 1967, became the world’s first. 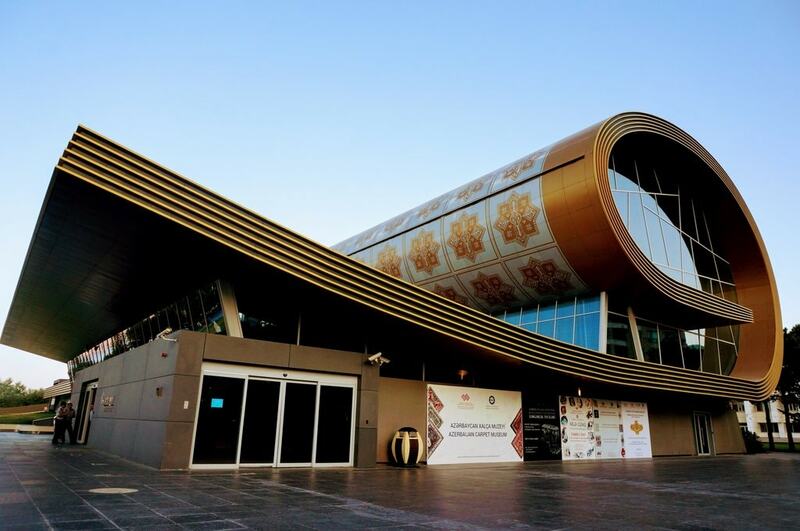 Enter the building that resembles a rolled carpet decorated with motifs and learn about traditional carpet-weaving and its importance in Azerbaijani culture. The Palace of Happiness, also known as the Palace of Marriage Registration today, combines elegance with romance and heartbreak. Oil baron Murtuza Mukhtarov replicated a building his wife admired in France. In 1912, Murtuza surprised his sweetheart with the large neo-gothic palace, another Jozef Plosko masterpiece. They lived happily for eight years until the Bolsheviks arrived in 1920. He shot the Bolshevik officers before killing himself; they imprisoned her. 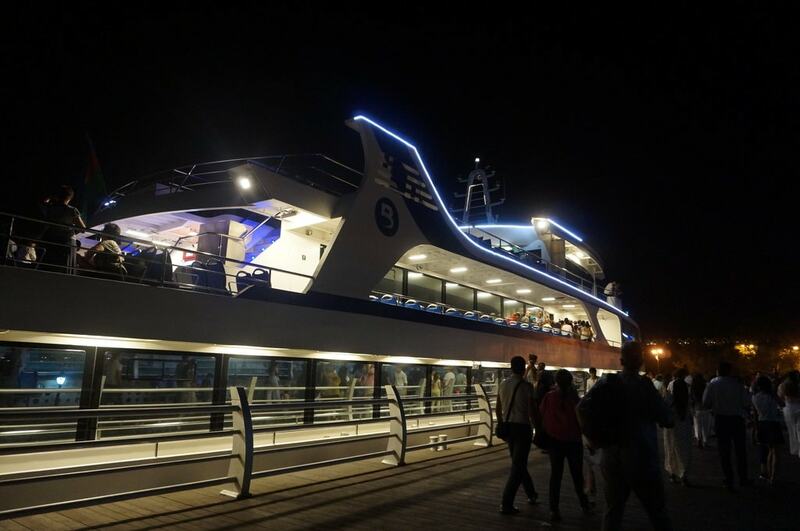 What can be a better way to see the evening skyline than taking a Caspian Sea cruise? The terminal lies in the centre of Baku Boulevard. Cruises go into the bay for approximately one hour, costing 6AZN ($3.50). Highlights are the glowing Flame Towers and the sparkling city of Baku. Pre-Soviet Baku was rich from their first oil boom, attracting the best European architects of the day. The Theatre, designed by Nikolai Bayev, opened in 1911. Today, you can catch a performance or visit to marvel at the magnificent art nouveau architecture. Towards the end of pedestrianised Nizami Street near Icheri Sheher stands the Museum of Literature. 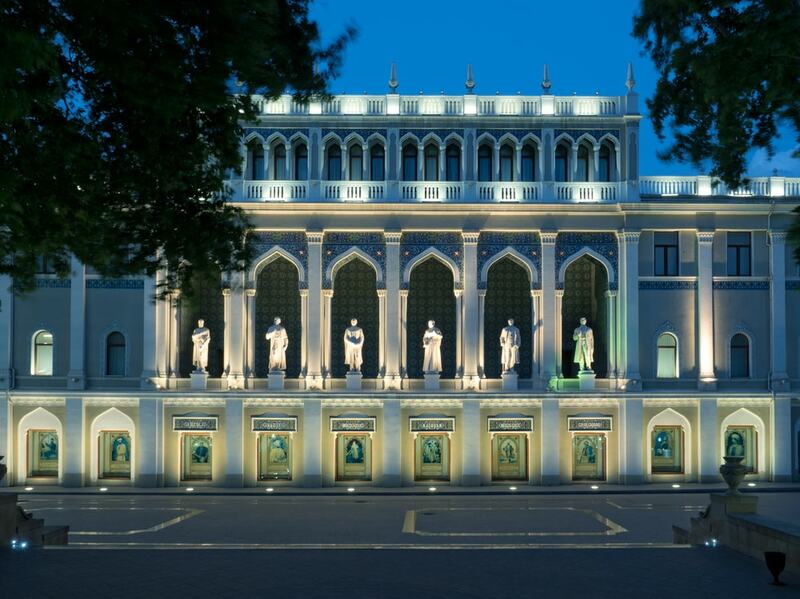 Named after 12th century Persian poet, the building has an attractive façade with six statues of famous poets and writers. Opening Hours: 10:00am to 5:00pm Monday to Saturday. Admission: 10AZN ($6). Many of Baku’s beaches suffer from oil pollution. But head 35 kilometres (21.7 miles) northeast to Bilgah and you’ll find a clean, sandy beach against the Caspian Sea. Admission is free, but you have to pay a small amount to use the sun beds.